As is usual in the world of scientific study and research, it appears that we may have found another superfood that has been consumed for ages, as early as 3rd century CE Asian cuisine. 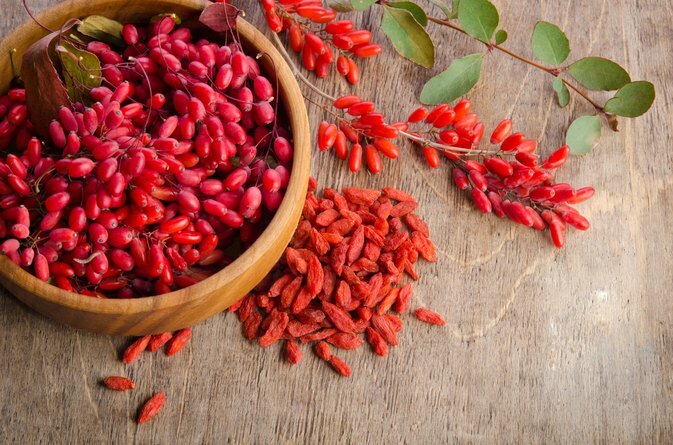 While studies and trials are still being conducted on the claims made about the positive effects of goji berries (also named wolfberries), many see that consuming goji in its many forms can help with organ health, diet, and may even help aid in cancer treatments. Rich in antioxidants, amino acids, and Vitamins A, B, & C, goji has been known to lower blood pressure and blood sugar levels, keeping your heart healthy. Until recently, you couldn’t find goji anything, but now you can find it in yogurt, assorted fruit juices, and your favorite granola bar. At All Star Health, we’re always aiming to provide to you the newest trends and superfoods on our site, and goji is one of the several we have available for you. The most common form of goji we have is juice. This form of the wolfberry is so delicious, you’ll forget that it’s healthy for you. Typically the berries in the original form have a very bitter taste, but after being juiced, the bitterness is much less potent and leaves a tart and sweet aftertaste. Here is a list of our most popular goji berry juices: Now Goji 32 fl.oz, Lifetime Goji Lycium Barbarum (Wolfberry) Juice 32 fl.oz, and Trace Minerals Research Ultra Mangosteen with Goji & Pomegranate 32 fl.oz. The second best version of this great superfood is the dried kind. As stated previously, the original form of the berry is very bitter, so the berries are sun-dried in order to reduce the bitterness. Some are literally sat underneath the sun and dried naturally, while others can be dried with a machine, but you’ll find that what we carry is made organically and sustainably. Check out these: Funfresh Foods Organic World Berries – Goji Berries 4 oz and Sunfood Sun-Dried Goji Berries 8 oz. At last we come to the common form of any sort of supplementation: the pill. For those of you who can be turned off by taste or have side effects from eating specific foods, the veggie caps will provide the goji nutrition sought after for those seeking alternate options. The plus sides to these are their cost and concentrated form. Take a look at these fine products: Nature’s Way Goji Berry – Standardized Extract 60 vcaps, Doctor’s Best Best Goji Berry Extract (600mg) 120 vcaps, and Paradise Herbs Go Ji 60 vcaps.